Defender Ryan Cresswell is warning his Cobblers team-mates they can’t afford to waste the effort put into last weekend’s superb win over Oxford United, and to follow it up with another positive result at Morecambe on Saturday. 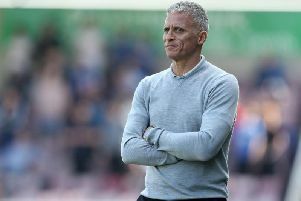 Northampton ended a four-match run without a win in Sky Bet League Two when they battled past previously-unbeaten Oxford 1-0, despite playing more than half of the game with 10 men following Jason Taylor’s sending off. It was a brilliant backs-to-the-wall effort from the Cobblers, and Cresswell says the team has to build on that victory at the Globe Arena on Saturday. “What we have to do now is go to Morecambe and get a result,” said the former Rotherham and Fleetwood man. “We did well doing what we did last Saturday, but what matters now is coming away from Morecambe with something. “We can’t come away from there and be defeated, we need to go to Morecambe and get a result. “Then we can come back to Northampton, and that will really strengthen us and get us up that league again. “That’s where we want to be, the lads are really looking forward now to the next game. The Shrimps have once again enjoyed a good start to the season, and currently sit in fifth place in league two, but only three points above 11th-placed Cobblers. It’s a great chance for Town to get themselves right back into the picture at the top of the table, but Cresswell knows it isn’t going to be easy. “It is always tough at Morecambe, you never get an easy ride up there,” said the no-nonsense defender.